When I first watched the commercial for “Inframundo de Athan,” I knew I had to see it for myself. In the TV spot, a little girl is crouched over a bed. At first she looks innocent and frightened, but the way the camera jiggles and zooms shows us that the girl is actually evil, and we should fear her. When I saw the ad, I stared at our TV set, astonished. I hadn’t seen a commercial that creepy for a long time. What was “Inframundo”? What was the Parque Diversiones, for that matter? I had to find out. 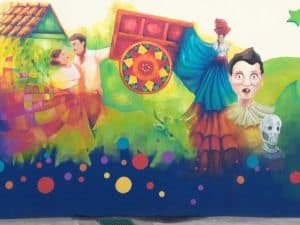 After 10 months in Costa Rica, I had somehow never heard of the amusement park on the edge of San José. Originally established as the Parque Nacional de Diversiones in 1981, the place was built to help fund the National Children’s Hospital. The idea is that the colones spent on roller coasters and Ferris-wheel rides end up helping sick kids. It’s like a healthcare system designed by Willy Wonka. “Would you like the regular pass or the special pass?” asked the woman in the ticket booth. At first I didn’t mind that no friends had time to accompany me. That’s cool, I thought. I’ll just go alone. I hadn’t considered what that meant: I was a poorly shaven 34-year-old male Gringo wandering alone in an amusement park full of Tico kindergartners. With my red beard and bleached skin, I tend to stick out already in the streets of San José, but in Parque Diversiones I might as well have been a rhesus monkey. 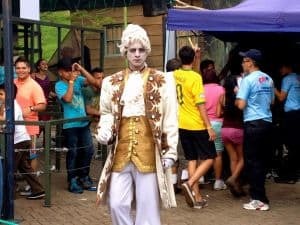 Costa Rica has enough creepy foreigners to worry about without a goofy journalist raising red flags. I weaved my way through the park, following the spidery paths past rides and kiosks. Parque Diversiones is a fairly standard theme park, with its looping coasters and carnival atmosphere. The park’s mascot is Tío Conejo, or Uncle Rabbit, a floppy-eared lagomorph so youthful-looking he should really be called Nephew Rabbit. In the center stands the Pueblo Antiguo, which mimics a traditional Costa Rican town. But Inframundo de Athan is something completely different. 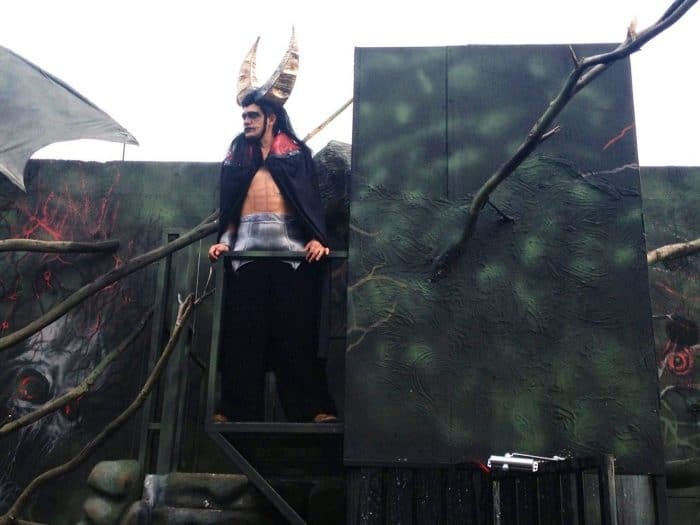 The structure is painted black and gray, and in order to reach the entrance, you have to pass an enormous sculpture of a horned demon with bulging eyes and outstretched claws. Performers roamed the walkway outside, but unlike the park’s usual bunch of magicians and clowns, these guys were imposing and satanic. One guy wore gothic eyeliner and a cape, and a makeup artist had drawn fake abdominal muscles on his naked torso. “Are you alone?” asked one of the park employees. It took me a second to realize we were speaking in English. The young man in the polo shirt uniform stood near me, looking increasingly excited to use his English skills. He finally asked where I’m from, stressing each syllable like an ESL teacher. We chatted for a bit, and then he herded me into a group of seven strangers. “Thanks, I will,” I called back, although I had no idea whether I could keep that promise. “Inframundo” takes groups of eight at a time. My group included two preteen boys, a preteen girl, three skinny little kids, and a stoic-looking father. We stood in a long line that snaked around metal barriers. Of the hundred or so people waiting, the mean age was probably 13. Above us, two TV screens played music videos, which made me feel even older, because the only pop star I recognized was Shakira. Every few minutes, the music stopped and a gravelly voice explained the concept of “Inframundo.” The story is remarkably complicated: Apparently there was once a warrior named Athan, and he journeyed into the Underworld of a distant planet to retrieve a relic called the Quartz Pyramid, but Athan failed in his mission. Somehow, this caused a mystical rift in the fabric of reality. Paranormal activity is spilling into our world, and we – daring middle-schoolers and 34-year-old Gringos – must journey into a labyrinth of terror. This answered my question: “Inframundo” is basically just a haunted house. Why a haunted house in July, when Halloween is still four months away? 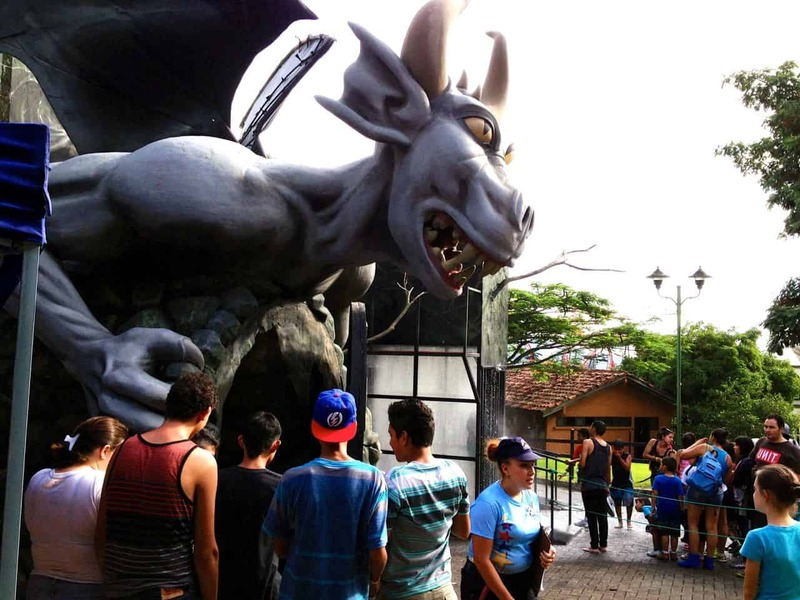 Because the attraction’s two weeks coincide with Costa Rica’s mid-year school vacation, when kids need to fill their afternoons by cavorting with demons from another dimension. “A little,” I said, erring conservatively. Just then I heard screaming. At the far end of the “Inframundo” building, there was a large glass box reinforced with iron bars. It looked like an ATM booth designed by Tim Burton. The box was filled with people, whose bodies were pressed against the glass. I watched in horror as torrents of water fell from the ceiling, drenching their clothes. T-shirts stuck to bodies. Jeans changed color from light blue to navy. Hair clung to faces like seaweed. “So… it might be bad for your iPhone,” the kid said helpfully. I had missed this tidbit, among the warnings to pregnant women and people with heart conditions, that “Inframundo” involved water. Torrents of water. Monsoons of water. Water enough to wreck my phone and all the paper in my pockets. But I had already waited for 20 minutes, listening to One Direction videos and playing a crummy knockoff of Tetris, and I hadn’t come all this way for nothing. So I stuffed the phone deep into my pocket, hoping that bending over a little or covering the fabric with my hand would keep the downpour from my wrecking my poor 4S. At last a park employee ushered us toward the entrance. But before we could step inside, we were asked to enter information into a computer screen. One of the kids punched his name into a digital form and picked an “avatar.” I hoped that I wouldn’t be asked to do the same, because I had no idea what the point of this was. As it turned out, the kid’s data-entry sufficed, and we proceeded. The door opened, and we ventured inside. Even for a haunted house, “Inframundo” is incredibly dark. It’s so dimly lit that I found myself feeling around with outstretched arms to even find the walls. This felt cheap. Why wouldn’t eight strangers feel tense after they’ve been sealed inside a narrow, pitch-black corridor? We hobbled up some steps and slid through the maze, bumping into walls and each other. I kept hearing breathing and gargling, presumably from the Underworld demons, although the stoic Tico father may have had a cold. In one small chamber, one of the demons appeared and demanded that we line up against the wall. Then he leaned into me and growled something incomprehensible. “Él no habla español!” shrieked one of the 12-year-old boys. Great, I thought. Thanks, kid. Like this isn’t awkward enough. But I sat down, then the others did as well. “On the count of three, run for the exeet!” commanded the demon, and then he repeated the instructions in Spanish. He counted, but the kids started running at “uno.” The demon sounded annoyed as he repeated the count in English, but I was already rounding the invisible black corner, trying to keep up with my group. The truth is, I love haunted houses, and as we acclimatized to the claustrophobic maze, I found myself enjoying it more and more. When we stumbled into another computer screen, one of the little kids took command: The screen asked a question and offered multiple-choice answers. Before I could translate it, the kid had already picked the right answer and we were again plunging through the dark. For a moment, we stepped into sunlight, passing a swampy little pool with monstrous heads poking out. The moment we passed them, the heads spat jets of real fire. I was delighted to feel infernal heat on my back. Nice touch, I thought. At one point, we found ourselves locked into a cage and spritzed with water. Our platform shifted over a primordial lagoon, and I thought nostalgically of “Johnny Quest” cartoons. When we finally reached the exit, I prepared myself for a thorough soak, but the glass box was empty. On the other side, the door hung ajar. The stoic Tico father and I made a beeline for the door and slipped into fresh air. 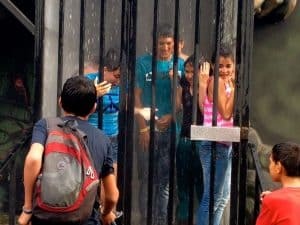 It hadn’t occurred to me that the “Inframundo” designers would allow their visitors a chance to escape before raining cold water on their heads. We were free, only slightly moist, and my phone was safe. We had escaped the Underworld unscathed. I couldn’t help but smile as I walked away from “Inframundo.” Someone had put a lot of thought into this little attraction, and even if it wasn’t a spectacular haunted house, even if its plot was overzealous, and even if it was dark enough to get completely lost, it was still a good time. Granted, the commercials seemed completely off base. (Where was the scary undead girl?) But the spot had motivated me to go, and that’s what commercials are for. Later I discovered that “Inframundo” is also an online videogame, and if you rack up 5,000 points, you may win a Playstation PS4 or 10 annual passes to the park. So aside from the fate of the universe, there is a lot at stake here. And again, proceeds benefit sick kids. The only thing on my schedule that afternoon was to survive a trip to the underworld, and now I had plans to meet friends for dinner. But I couldn’t leave Parque Diversiones without riding El Búmeran. In the spirit of a boomerang, the rollercoaster twirls in one direction, stops, and then rides the same course backward. I hadn’t ridden a rollercoaster for half a decade, so when the park employees locked me into my seat and the cars started to back up the incline, I was thrilled. “Have you done this before?” I asked the crew-cut grade schooler next to me. “Yeah, watch.” The rollercoaster stopped moving. We were held fast, at a 45-degree angle, and we were high enough to see all the way to Escazú. As we stared down the curving track, the kid counted. “Uno… dos… tres… cuatro…” Then he shouted: “CINCO! At that moment, the locking mechanism released us, and we dropped perilously downward. And I remembered, in that moment, as my stomach surged toward my throat, exactly what it’s like to be 10 years old.